Aim: The aim of the track is to bring together researchers and practitioners from industry and academia and provide them with a platform to report on recent developments, deployments, technology trends and research results, as well as initiatives related to embedded systems and their applications in a variety of industrial environments. Submission of Papers: Manuscripts must be submitted electronically in PDF format, according to the instructions contained in the main Conference web site. Please anonymize the paper submitted for review. The paper length is 6 pages, with the option to add 2 additional pages at extra charge (80 USD per page), up to a maximum of 8 pages. Contributions must contain original unpublished work. Papers that have been concurrently submitted to other conferences or journals (double submissions) will be automatically rejected. Paper Acceptance: Paper registration is required, allowing the inclusion of the paper/poster in the conference proceedings. 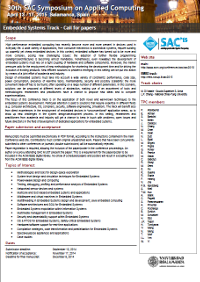 An author or a proxy attending SAC MUST present the paper: This is a requirement for the paper/poster to be included in the ACM/IEEE digital library. No-show of scheduled papers and posters will result in excluding them from the ACM/IEEE digital library. Graduate students seeking feedback from the scientific community on their research ideas are invited to submit abstracts of their original unpublished and in-progress research work in areas of experimental computing and application development related to SAC 2015 Tracks. The Student Research Competition (SRC) program is designed to provide graduate students the opportunity to meet and exchange ideas with researcher and practitioners in their areas of interest. Please note SRCs and regular papers must be submitted at different pages of the START web system. Submitting the same abstract to multiple tracks is not allowed. It is recommended to refer to the official SRC Information Sheet for further details.